Passive Infrared (PIR) sensors are widely used in smart lighting systems and save money by dramatically reducing lighting usage and energy consumption. They are employed in offices and classrooms as well as in spaces with intermittent and unpredictable lighting usage, such as corridors, stairwells, storage areas, and parking garages. Lights can be programmed to either “dim” or “switch” in response to an occupancy status signal from a sensor. The strategy also improves comfort for occupants as they never have to enter a dark area or manually turn lights on or off. How does a PIR sensor detect motion? All objects, including those that are inanimate, emit heat energy in the form of infrared radiation. Humans, animals and plants generate stronger infrared signals than inanimate objects because they burn energy that generates heat to maintain (self-regulate) a particular temperature. 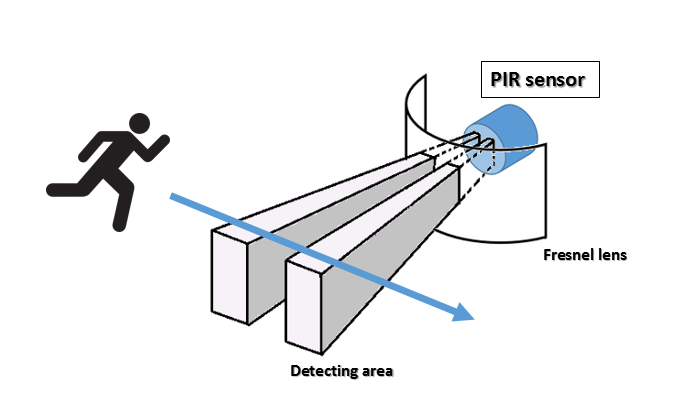 PIR sensors measure infrared light radiating from objects in its view. Anything that moves in front of a PIR sensor with a temperature different than the background of the view area will trigger a pair of pyroelectric elements on the sensor to react to the change in temperature with instantaneous differences in output. These differences in output generate energy, which triggers the sensor to transmit a detection signal to the light(s) to turn on. Simply put, the sensor detects a motion that indicates an occupant is in the space and light(s) turn on. There are two distinct parts of a PIR sensor: the sensor element and the cover or lens. The round metal sensor element is the sensor itself and it detects the level of infrared radiation. The cover or lens focuses the infrared signals on to the sensor. It determines the breadth of the sensing coverage area, the sensing range, and the sensing pattern. The lens is just as important, some would even say more important in some cases, than the sensor element. The lens can have multiple facets that each look for a heat signature, so the more facets the lens has, the denser the sensor’s coverage area, meaning that there is a higher probability that an object in motion will cross a sensor’s beam and trigger the sensor (and the light). Using the same sensor element with two different lenses will provide different detection patterns and coverage areas. Sensors can have a long range or a short range. With the extended range, the facets view angle is wider (approximately 120-140 degrees), and with the short range or standard range, the facets view angle covers a narrow angle (approximately 90-110 degrees). Many people think the coverage area of a PIR sensor is in the form of a complete circle but this is not true. If you have a top view of the area, you will see slivers of coverage separated by gaps of non-coverage. If you have a side view of the same area, you will see coverage as a conical shape. In either case, coverage is not in the form of a complete circle. Once the coverage area and class of motion is identified, proper placement and setting the required sensitivity level of the sensor must be determined. In Part 2 of this series on PIR Sensors, we highlight best practices for configuring sensors for maximum efficiency and savings. We look at proper sensor placement and setting accurate sensitivity levels as well as how to reduce false triggers and sensor time-outs. Newer PostIES Ready Reference App Now Available!